In a previous tutorial we walked through creating a logotype in Illustrator and warming it up in Photoshop. This prompted a very good question from a few folks; how do I return my artwork to vector? Let’s take a look at an easy way of breathing the beziers back into your bitmaps. Converting the above back to vector format requires a few simple steps. If you’re worried about superfluous file size/disk usage, you can save out a *.jpg at the larger size and keep your working file smaller. You’ve all heard of Live Trace (or Image Trace since CS6). For this tutorial, we’re going to open our *.psd or *.jpg in Ai, and use Image Trace to convert our raster artwork to vector once again. We blew up the size of our Ps document to give Image Trace the best chance of correctly interpolating our logo in vector form—the more pixels you give it to work with, the more accurately it interprets your image. Head to File > Open... and select your *.psd / *.jpg file. Ensure Flatten Layers to a Single Image is selected. Hit OK.
With your artwork selected, head to Window and ensure the Image Trace tab is visible. Click on the Advanced arrow and tick Ignore White. Hit Preview and check out the result. Fig. 03 – A zoomed-in shot of the texture, now represented with vectors. There’s a good chance it’s looking great at this stage—make sure you’re zoomed out to take it all in. If some lines have strayed a little, try unticking Snap Curves to Lines (ticked, this option replaces slightly curved lines with straight lines, reducing unnecessary nodes). It’s worth having a play with the Threshold slider as well—it yields behaviour reminiscent of Fig. 16 from our tutorial on creating a logotype from beginning to end. Once you’re happy with how it’s looking, commit the results by hitting Expand. Fig. 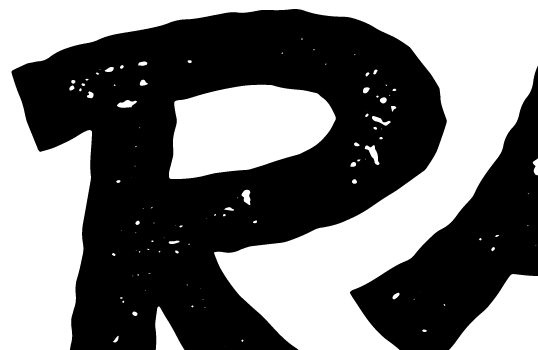 04 – Vector on the left, bitmap on the right. Vector ends up being slightly more crunchy. In enlarging our canvas sufficiently, Image Trace had plenty of material to work with, and has produced an acceptable vector equivalent. There are a few wee things to consider when going back to vector. One is that the final vector file produced shouldn’t be used to edit or tweak the logo. Always make your edits in the original *.ai (i.e. Fig. 01) and update your files down the line until you get back to a new, updated, final vector file. As we mentioned before, we are currently working on a new tutorial that goes in-depth on how to make this process sing. The vector file produced shouldn’t be used to edit or tweak the logo. Always make your edits in the original. Another thing is that the resulting vector file will be larger and more bloated with nodes than your original logotype. For some perspective, our original file for our Trace artwork is made up of 67 nodes, and sits at 142Kb; a fairly modest figure. Once given texture in Ps and re-vectorised, however, it weighed in at an ungainly 2806 points and 222Kb. However, to be fair, this difference is all but completely unnoticeable. And that’s it! We hope you found this useful. We are all about writing tutorials on topics you want to hear about, so email us at [email protected] with any suggestions or questions, or hit us up on the socials below. We look forward to hearing from you. Also, if you found this tutorial handy, hit those share buttons up the top there hard and tell people about it. oh wow, I learned some thing new from this article! I bring artwork back to illustrator using PSD by using the selective brush tool > work path > then selecting > and then finally pasting it into illustrator! :-p but I will definitely try this new method as I didn’t even know you could control the image trace feature like that! So there is no problem at all, if I apply some kind of editing in Photoshop and then complete the whole task in vector format. I hope because of conversion there will not be any quality issue in that artwork. Thank you for explaining the whole idea in a detailed way. It really depends on the type of editing you’re doing in Photoshop. Experiment with Live Trace settings, and see what works for your project. There will always be a sacrifice when going from bitmap to vector, as instead of describing your design with pixels, you’re using a series of mathematical equations. It’s a lighter and scalable format, but this comes with limitations. Becoming familiar with the results of these limitations is best practiced by eyeballing your Live Traced design and learning how it behaves with different sources. Hope this helps! It largely depends on the raster file quality. If you have pretty good quality with high resolution image, I don’t think we need to convert raster to vector. Raster file is so much important for this services. The vector output will depend of regulation of raster files. Thanks for your awesome tips. Hope some more soon. It is not necessary to convert into vector file after editing in photoshop if the raster file is with high resolution. But still thanks for the useful tips. The article contains quite a good number of suggestions and thanks for sharing those. Clipping Mask is very good technique for removing background. Hope that , everyone will like your tips , Thanks .